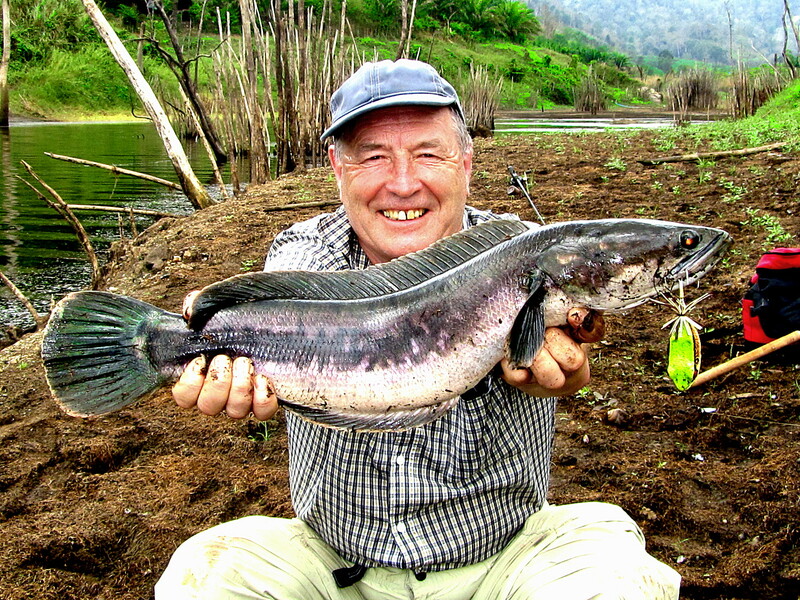 Snakehead fish are not the most famous fish species that live in Thailands waters but they are definitely one of the most exciting for anglers fishing in Thailand. The Giant snakehead (Channa micropeltes) is the main target. Use topwater lures, poppers and frogs for extreme surface strikes. Plah Shado as its know in Thai language is the second largest representative of the widespread Asian snakehead genus: Channa. They are highly territorial and will strike lures readily if they are in the mood. The other species of snakehead you may encounter when fishing in Thailand are the Striped snakehead (Channa striata) which can be found in just about every water body in Thailand including puddles. Rarer species can also be found such as the largest member of the snakehead family the Cobra snakehead (Channa marulius). The Emperor snakehead (Channa Marulioides) is a smaller size species but a much prized and rare catch for anglers fishing in Thailand. Giant snakehead skin patterns are very beautiful with stark black, white, purple to blue colours blended together to create a stunning camouflage. Snakeheads are predatory fish and can be recognized by their long dorsal fin, snake like head which has large scales on the top. They have a large mouth with sharp teeth for attacking and grabbing prey items. A snakeheads attack is usually vicious and aggressive. The first hit on its prey is basically a disabling move and the victim is usually left wounded and stunned, dead or dying floating in the water helpless sometimes severed into several pieces as the snakehead wheels around to clean up and finish its meal. Channa are considered a valuable food fish in Thailand due to their fairly boneless meat. Larger species such as striped snakehead (Plah chon) also known as common snakehead, chevron snakehead or snakehead murrell are farmed in aquaculture. The meat from this prized fish is thought to have medicinal properties for healing and is recommended to be eaten after operations. When very young the snakeheads diet will consist of plankton, and later aquatic insects and mollusks. Adults mostly feed on other fish such as carp, also frogs and sometimes birds, mammals like mice or lizards are taken. Its easy to see where Giant Snakehead (Channa micropeltes) got its other common name in USA of Redline snakehead. These fry are almost a month old. They start out a full blood red colour all over then develop these stark orange, white and black lines. Juvenile colours are paler as the stripes fade and change before maturing into adults of varying patterns ranging from stunning Black/White/Purple/Blue camo to the darkest black slug looking shades with pure white bellies. Markings and colouration depends greatly on the surroundings, water turbidity and ph levels. Snakehead fishing in Thailand is very exciting and will get your adrenaline pumping quickly, Surface lures are the most exciting tactic and weedless baits work best due to the snakeheads love of snagged up areas where they can ambush prey that is unfortunate enough to swim past. Rapala lures and similar also work well but its advised to upgrade hooks and split rings from the standard factory quality. Snakehead fishing is hard work and it is imperative to be able to cast accurately and at sometimes long distances from a boat. The fish generally inhabit areas close to the margins of waters and around submerged items which provides cover for them to hunt from. Snakehead are also fairly spooky fish so the first cast into an area holding fish needs to be on target.